What is Hamilton Norwood Scale? The doctors, medical team and trichologists working on hair loss treatment classify the male pattern baldness with a particular code. This code is determined by the Hamilton Norwood Scale. In the 1950s, Dr. James Hamilton has introduced the scale and later it is updated by Dr. O’Tar Norwood in the 1970s. Dr. O’tar Norwood has modified the stages and added new classifications. The Hamilton Norwood Hair Loss Scale is a tool to assess how severe a man’s hair loss, in other words; the level of baldness. Men lose their hair in different patterns. Some may lose the hair only from temples, some may suffer from hair loss at the back of the head called vertex, or some may have a receding hairline and at the same time hair loss at the back. If a man’s hair loss type is higher on the scale, it means that his options are limited for hair loss treatment. For example, some medical substances, such as Minoxidil (Rogaine) and Finasteride, are not effective anymore for the hair loss type 5 and over. To have an idea about the Norwood Hamilton Scale, you can easily spot your hair loss type on the scale by examining the pictures and explanations below. Stage 1 is for the least amount of hair loss in the hairline. Hence, there is no need for treatment. However, if you have already genetic hair loss in your family, please follow your case and decide the appropriate time for the treatment with an expert. This stage is for the hair loss at the front temporal sides, the shape is like triangular at both parts. A small amount of hair loss also appears in the middle of the front head. At this stage, it is better to understand what are the reasons for this type of hair loss, whether it is male pattern baldness or another reason. After stage 3, we can start to talk about baldness although it is scaled as “small to moderate” degree of hair loss. Baldness in the temples are now clearly visible with a symmetrical recession and it may be disturbing. Small amount of hair loss in the crown area may also occur in this stage. 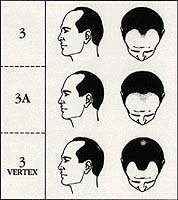 Moderate level of hair loss in front temporal sides and receding hair and a small open area can be seen in the crown part, also known as the vertex area. Starting from hairline to the crown, in the middle of the scalp, there are natural hairs with moderate density. A “moderate to large” amount of hair loss is visible in Stage 5. Hair loss at the back (vertex area) and in the front temporal parts are still connected with natural hair. However, the balding at temporal and vertex regions are larger than before. Now we can talk about a large balding area and a considerable amount of hair loss. Starting from hairline to the crown area, the balding area has only very thin natural hair. Also, hair loss on the sides is increased. This is the highest point of baldness. The hair is almost only present at the back of the head from one side to the another. Since the bald area is very large, hair transplantation will only cover a certain part, not all of it. So, this kind of baldness may require more than one session of hair transplantation. If you need further help about determining your hair loss level and what kind of operation you will need, please contact our case managers with expertise.